Well Kevin came up to stay this weekend – so we had a packed gaming schedule to get through!!! 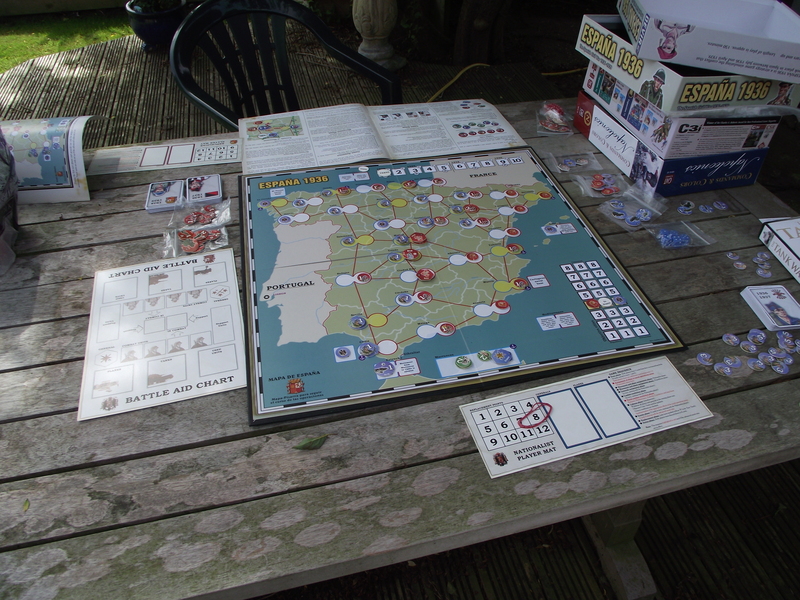 Firstly I had organised a Sharp Practice 5 scenario campaign – based on one I had taken off the Two Fat Lardies site – the retreat to Corunna. 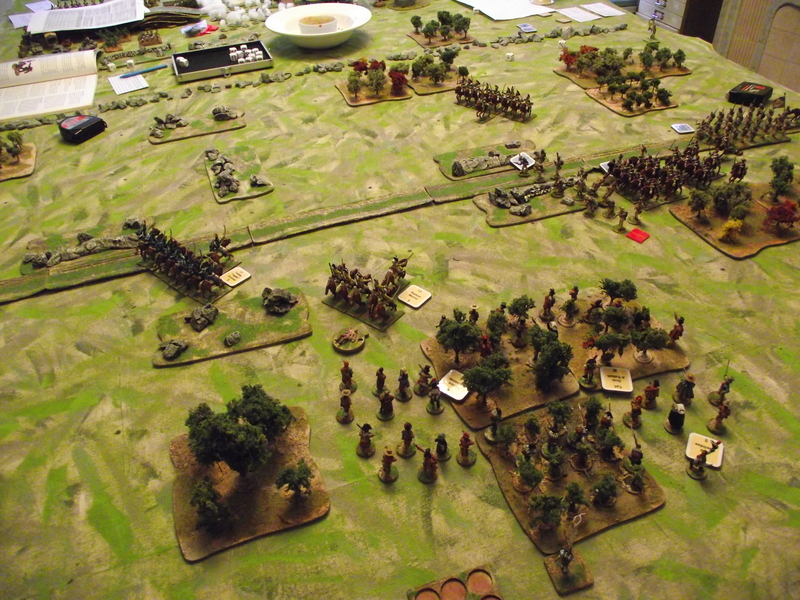 I had changed it to be a French force chasing a Spanish force – and tinkered with the victory conditions. First game – Kevin swept on cavalry first – followed by lights – followed by a marching column . My Spanish cavalry were swept away, leaving the Guerillas on their own. They could not stop the French capturing in the main deployment point, and thus the scenario was lost. In the subsequent dice rolled pursuit and desertion that followed most of the guerrillas sloped away, leaving me 6 of the core force to fight the next scenario. At this point we gave up!!! The Spanish lost to my inept handing of them – and the rules punished me. Still like them. So, the whole weekend had come crashing down – what to do? Well Kevin had bought a set of WW2 Africa rules – War without Hate (or the German version of Rommel’s famous quote). Much like MegaBlitz that they are staged at the battalion level – so you play with whole divisions. We decided to set up a Sidi Razegh style of battle. We had a static Italian force defending a fortlet line, with a small mobile counterattack force. Attacking these were two brigades of Indian troops. Around the left flank a full New Zealand division swept in their lorries. It was assumed that the Brits armour would be doing a wider sweep round the left off table. Coming on to surprise the Kiwi’s was a DAK panzer division. The Allies had the ability to call a tank brigade in from the left. The picture shows the advance (Kiwi’s on the right, Indians getting to grips with the Italians on the top left) before the DAK announces itself to the world. Figures are 15mm various from Peter Pig, Old Glory, PSC and Zvedsa. Kevin playing the DAK swept on – took out one brigade of Kiwi’s like a knife through butter. But my recon got in amongst his following infantry and stopped/destroyed it. Unsupported he fought on until the fortlets fell to the Indians where he then conceded and withdrew. Revenge was mine!!!! 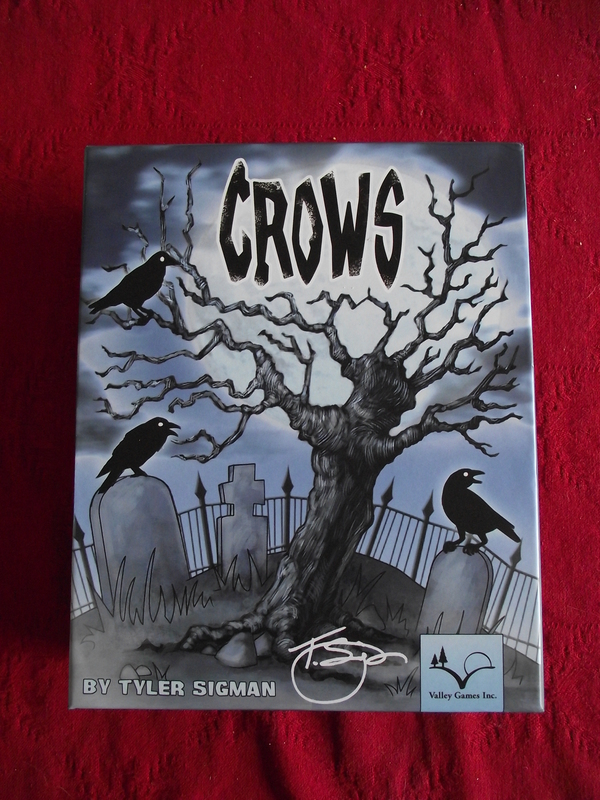 Really good game – I was suspicious of the old school nature of the rules – but they were really simple and by the end of the game you didn’t need them. Might just get hold of a copy. 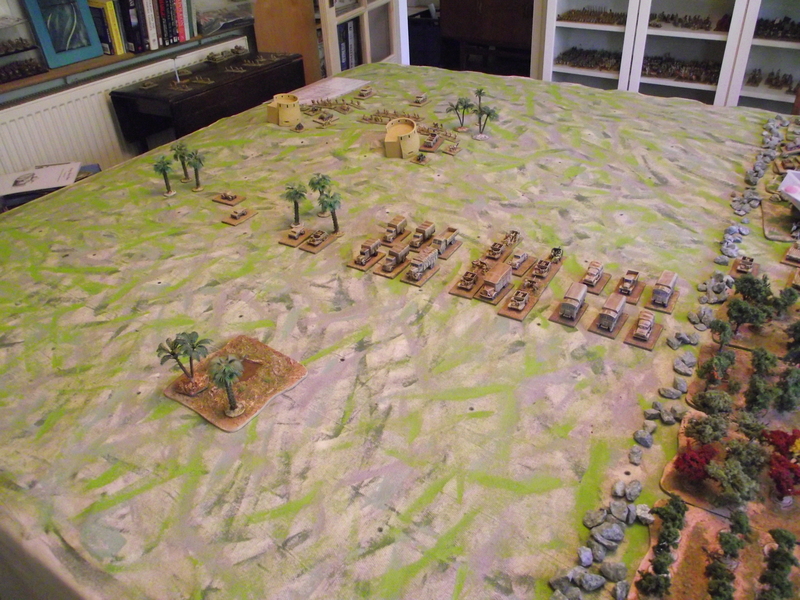 Next up we played an ECW game with my 28mm – no photos sadly – Peter Pig Regiment of Foote v2 rules – quick and brutal – Kevin whipped my arse!! Next we retired to food and drink and the luxury of board games. Played this a few times now – and each time getting started has been a problem – the rules, although lauding themselves about winning prizes are not that well laid out – and examples non-existent. 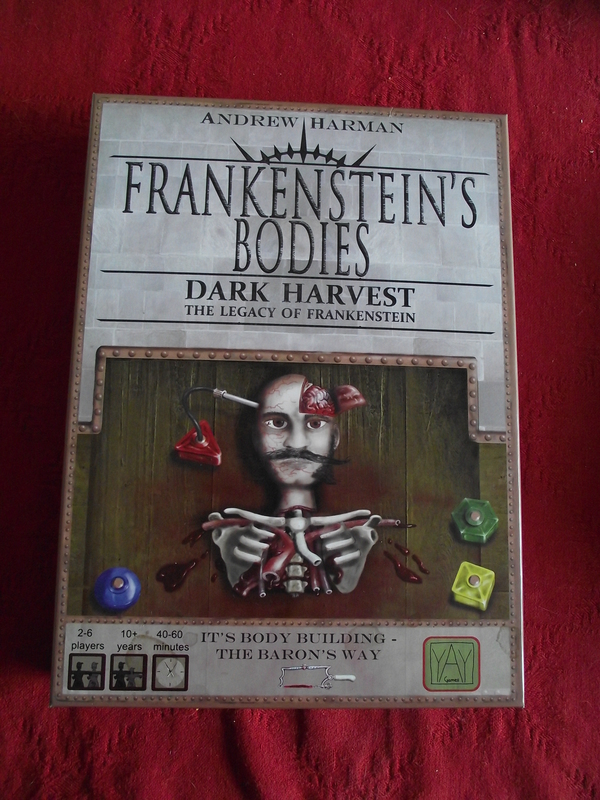 Once you get going, it’s actually quite simplistic and a nice ‘grudge’ game – stealing body parts and surgeons from the other players to make your perfect bodies!!. 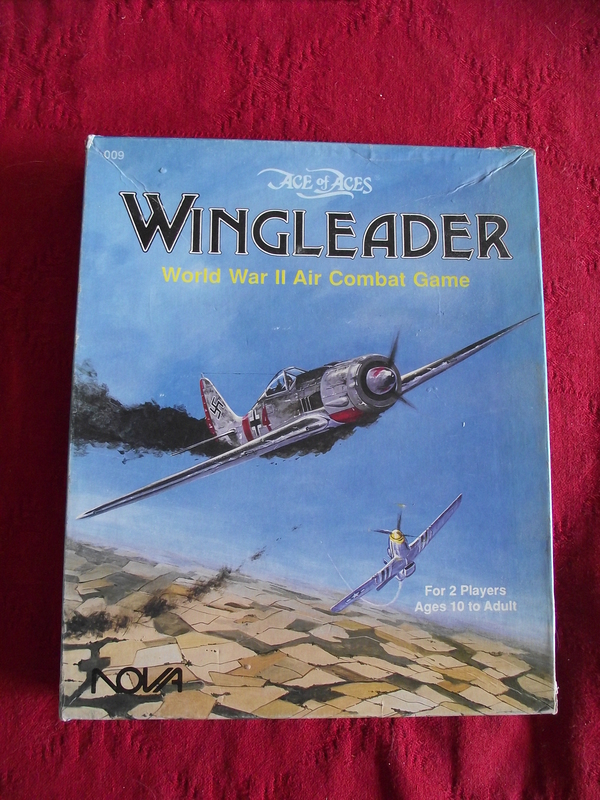 Next an old favourite, literally, Wingleader. This version came out in 1988………..and its as good now as it was then. Played several games, each time shooting down Kevin’s plane – the only time he got me was when we crashed into each other front on!! Brilliant game – not played for years – but picked it straight up and played. Check it out. The next day we decided to play outside in the sun. Espana 36 – Spanish Civil War at region level. I played the Republic and over 10 turns representing 1936 to 1939 I gradually pushed Kevin’s Fascist forces back to Galicia – until his only free objective city was La Corunna – then the wind gusted and ended the game!!! It’s a great game – easy system – easy combat – and through the linked region layout of the map it allows multiple strategies – as the republic I held Madrid initially then drove hard to the south – captured Cadiz and then turned North and worked my way up the Portuguese frontier. Kevin attempted to take Madrid and then tried to drive East – I managed to stall him by throwing in the International brigades and anything else I had in. Kevin had loads of Italians and planes – all gathered through the 3 event cards each turn – I only had one paltry delivery of tanks and planes from Russia!! Another great game – I’m taking the victory though!!! Bad luck that wind ended the Spanish Civil War! Natural disaster simulated- what a game!